Going out and pounding the pavement or pedaling to the horizon is an important part of building leg muscle endurance. After all, muscular endurance is the ability of your muscles to repeatedly perform a task for a long period of time. But that's only part of it. Doing exercises to build strength and teaching the muscles to respond repeatedly under load will enable you to go longer and perform stronger. Ideally, you have a periodized training program. Periodization involves dividing your training into phases that vary in volume — the amount of sets and reps — and intensity, or the amount of weight you lift. Not only does periodization protect against injury and overtraining, but it also is the most effective way to train for improved performance in any sport. A periodized program will include a strength phase and an endurance phase. The strength phase focuses on lifting heavier weights for lower reps to develop maximal strength. The greater your muscular strength, the greater the force you'll be able to sustain over a longer period of time. To build strength, you typically lift a heavy weight for one to eight reps. In the endurance phase of your program, your weight should be lighter and your reps should be higher — about 50 percent of your one rep max (if you know it), or low enough weight that you can do 15 or 20 reps without giving up. You should also lift faster. Strength lifts tend to be slow; with all that weight they pretty much have to be. 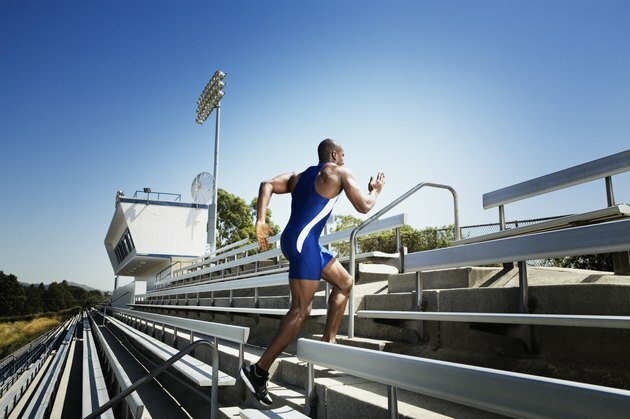 But if you think about the activities you need endurance for —biking, running, soccer —- you need your muscles to respond quickly, over and over again. This type of lifting will train them to do just that. Compound exercises use all or almost all of your leg muscles at once. Examples include squats, deadlifts and step-ups. Isolation exercises, like hamstring curls, only use one muscle at a time. Compound exercises are more metabolically and cardiovascularly stimulating than isolation exercises, and they more closely mimic the demands of sports and other endurance activities. Plyometrics are body weight exercises that involve some sort of jumping or explosive action. Jump squats, box jumps and switch lunges are examples. Whipping out 20 or 25 box jumps in a row teaches your muscles and tendons to contract and expand repeatedly like springs. High-rep plyometrics are also a 10 on the intensity scale, akin to running sprints or doing another type of high-intensity interval training, which increases V02 max and other markers of aerobic capacity, according to a 2013 research review in PLoS One. There's no break time when you're training for endurance. Do your exercises back-to-back, immediately switching from one exercise to the next without rest. For example, do a circuit of squats, single-leg deadlifts and step-ups. Do one set of each, then repeat for three to five rounds. You can also work in your upper body, alternating between a lower-body exercise and an upper-body exercise. This gives your legs a little break, but keeps your cardiovascular system on the go. If it feels easy, you're doing it wrong. You want to feel your muscles burn at the end of your sets, and your heart should be pumping. The longer and tougher your workout, the better for your endurance. Work in bouts of cardio with your exercises to really challenge your legs, heart and lungs. At the end of each round of your circuit, jump rope or hop on the treadmill and run a set of three 30-second sprints with 30 seconds recovery in between.